Nano-level surface processing is becoming increasingly important in the development of modern materials. Laser technology allows to change the processing parameters in a wide range and achieve the desired surface properties – hydrophilic and hydrophobic for various fluids. In such circumstances, the benefit of any researcher would be to provide software that can quickly and visibly see and measure the shape, size and configuration of nano and microstructures to be obtained. It is especially important that the obtained results in the form of 3D graphs allow us to see the evolutionary trends of surface nanostructures and help to decide on changes in the processing parameters. The researcher would be given the opportunity to input a wide variety of parameters – laser wavelength, pulse power, polarization angle, pulse frequency, pulse duration, processing time or number of impulses per coordinate – and the result obtained in a short time would serve to better understand common trends and help to make an informed decision for the actual processing parameters to be used in the experiment. In control literature, one can easily find a variety of different examples for industrial control, where contemporary control algorithms are implemented. Surprisingly, there are not many known examples where the state-of-the-art control algorithms have been implemented in real-time control systems. Instead, researchers usually implement algorithms that are proven to be reliable, fast and easy to implement. One control solution that has been proven to satisfy all previously mentioned attributes is PID. However, despite all its good assets it has two major deficiencies. One of them is that it can’t adapt on the diversities caused by the variation occurring in the model parameters and still it can’t control nonlinear systems due to multiple operating points present there. Therefore, to deal with those weaknesses an improvement in PID control structure has been introduced in the form of supervisory mechanism (SM) which as a main constitute part has a quadratic polynomial model. Thus, the control value of the newly proposed PID algorithm is formed of two terms, the first one is the value calculated by standard PID and the second one is the value calculated by the SM. The quadratic model forming part of the SM is obtained based on the past value of the error. Nevertheless, the use of quadratic model introduces additional complexity into the PID controller. Furthermore, the quadratic model should be updated fast enough and also it has to describe the data adequately. These aspects are analyzed and discussed in details in this paper. Moreover, an algorithm is introduced which will guarantee that the data used for calculation of the quadratic model is suitable. This article discusses a modelling approach for the welded seam form obtained by electron beam welding based on experimental data and types of mathematical functions. The process of electron beam welding is carried out by dividing the electron beam into two parts, resulting in the formation of two liquid baths. The samples that are welded are made of stainless steel with a change in process parameters: the distance between the two electron beam parts and the ratio of the power distribution between the two beam parts, the frequency of the deflection signal, the beam current, and the welding speed. Focusing current is of constant value. The weld cross sections shown in different process parameters are used to evaluate their shape using standard mathematical function – Gaussian functions. The research covers the usage of the random numbers in Monte Carlo simulations for air pollution models. Two new random number generators are developed; their strengths are compared with the existing random number generators. The results in this paper showed that the two newly developed random number generators achieved better results on a basis of failed test, however it extended the time for generating random numbers. In future we plan to use the newly developed random generators for filling the missing values in the measurements. This paper deals with dynamic analysis of particular type Construction Cranes known as tower crane during rotational motion of its jib. Methodology of analysis consists of Schematic Design of model, which implements schemes with block diagrams to analyze cranes and their parts during particular work cycle. This procedure consists of crane model development of interconnected elements that represents crane parts, 3-D visualization and simulation of motion. Analysis will be carried out through simulations, and solution of Euler differential equations of second order gained from schematic model. Dynamic parameters investigated are: acceleration, angular velocity, forces and torques in main parts of crane, and influence of load swinging. Diagrams will be presented for main parts of crane as the solution results of the analyzed system. Results gained will be used to get conclusions about dynamic behavior of crane, present graphs of main parameters and search for regulation of optimal jib rotation. Analysis will be done using modeling and simulations with computer application MapleSim. Also, results gained from simulations will be compared with those from experimental measurements. The direct problem in ultrasonic testing (UT) is: “Evaluation of attenuation coefficient by means velocity of ultrasonic wave propagation, frequency and grain size in polycrystalline materials”. The inverse problem in UT is formulate as “Non-destructive evaluation of grain size by measurement of acoustical characteristics”. The values of acoustical characteristics (V V f ) L T L ; ;α ; are measured, according ASTM E 494:2015. In this article a equation for grain size (D) is derived. The paper presents standard statistical robust bi-criteria procedure for determining expert assessments for the influence of magnesium alloy components on the controlled mechanical properties: tensile strength and relative elongation. There are obtained regression models describing mechanical characteristics from the amount of aluminum, manganese, nickel and silicon directly related to the exploitation properties of the product. The applied bi-criteria approach makes it possible to determine of compositions ensuring relatively optimal values of the explored quality indicators. 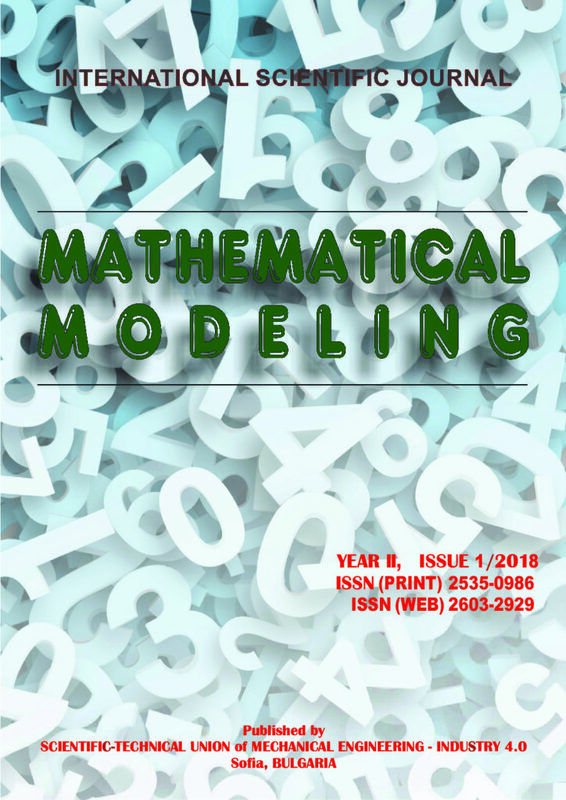 This article uses mathematical mathematical models of tasks by Stefan and Stefan-Schwarz describing the technologies of IMSCHA "Acad. A. Balevski ". Described are processes for solidifying a drop (droplet) over a surface of a metal substrate. Processes of solidifying of metal melts in the form of spheres having a radius of 50 nm are described. The temperature fields of the open thermodynamic system drop / substrate system are presented. The influence of the change of specific parameters from the hardening process is represented by the type of the temperature field of the OTS. Maritime industry is characterized by highly globalized structure and operations. Shipping companies apply various approaches for inter-industry cooperation and information exchange. Operational efficiency is strongly enhanced by improved communication and cooperation by all stakeholders and partners. The present article outlines the benefits of business process modeling approach to maritime operations. A conceptual model is proposed, identifying the main processes and benefits for efficient information exchange and cooperation between shipping companies. A quasi two-dimensional mathematical model describing the process of forming the initial kinematic parameters of the fragmentation field was developed. It has been shown that the use of the continuous explosive initiation system allows for increasing the relative area of the target damage with up to 23% with varying degrees of damage. In this paper a general structure of an administrative process development is proposed. A block diagram showing the logical dependencies in the development is also given and analyzed as well as the basic structures for the variants to implement the core element "task" in a an administrative processing. A concept for generalization in some of the administrative process stages is given as well as an approach to the most commonly executed internal procedure that is the approval one.